A peregrine falcon briefly visited the project site before returning to the man-made nest box in the Tappan Zee Bridge. The migratory bird is one of a pair that is believed to visit the Tappan Zee annually with each nesting season. The Tappan Zee Bridge’s peregrine falcons are nesting again in the structure’s man-made nest box. These remarkable creatures, which are the fastest members of the animal kingdom, can now be seen sitting on eggs on the project’s live FalconCam. 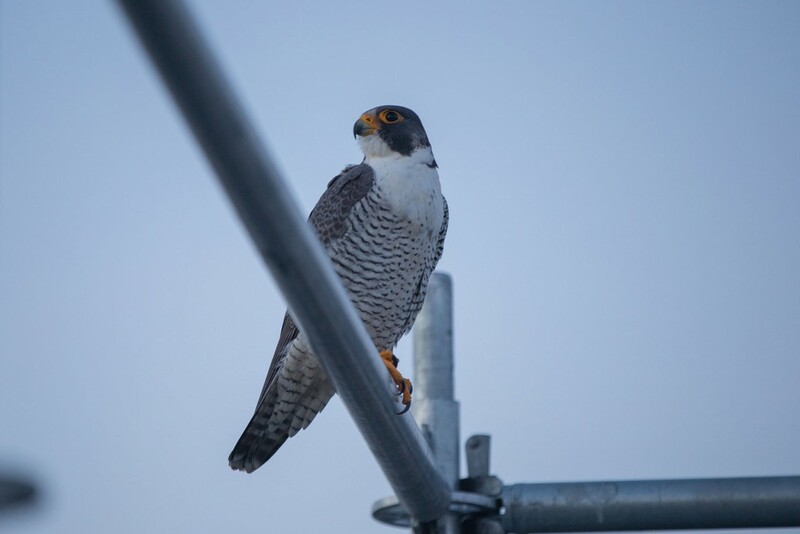 Peregrine falcons have visited the Tappan Zee Bridge for decades, following the installation of a man-made nest box atop the bridge’s superstructure – maintained by the New York State Thruway Authority. While the local pair of peregrines roam the area throughout the year, the nest box provides prime real estate for the nesting season, which occurs annually in early spring. Environmental experts suggest that the same pair have resided in the bridge for many years, as the species tends to mate for life and are territorial. Nest boxes have supported New York’s falcon population in recent decades, providing shelter and high vantage points from which the peregrines can scour for and dive after prey. During these dives, peregrines are capable of exceeding 200 miles per hour. Peregrines primarily hunt other birds, such as pigeons and ducks. The nesting season occurs between February and April, with peregrines typically laying three to five eggs over the course of approximately eight days. While laying, the female falcon becomes lethargic, fluffing her feathers and leaning forward while perched. The chicks, otherwise known as eyases, will likely hatch approximately one month after laying. Over the following two weeks, the parents will care for their young almost constantly. As the nestlings age, they are left alone for longer periods of time until they leave the nest after approximately 40 days. During the 2016 nesting season, the falcons were observed preparing to lay a clutch of eggs in late February. Starting in early March, the female then began staying in the nest box overnight, with the first chick hatching by April 17. Only one single chick was born last year, however the pair has previously had as many as three chicks in a single nesting season. The young peregrine relied on its parents throughout the following weeks as it grew in size. By late May, it successfully fledged, learning how to hunt and survive on its own. When young falcons mature, they can migrate great distances to establish nests of their own. To help protect the falcons during the nesting period, the project team has placed a 100-foot construction-free buffer area around the nest box. While the falcons have been unaffected by the construction efforts on the Hudson River, they have been spotted by the project team on occasion. Most recently, a single peregrine was spotted near an inactive area on the new Rockland approach – stopping briefly before continuing toward the Tappan Zee nest box. Keep an eye on the live FalconCam as the season continues. Note: The falcons are wild birds and their behaviors reflect what happens in nature. Some of their actions may be unpleasant to watch and it is possible that some of the fledglings may not survive into adulthood. Get the latest project updates and more right in your inbox.